Up until a few years ago I never really cared for Robert E Howard's most successful literary creation, Conan: I was aware of him, and aware that the Marvel comics series was highly regarded, but I only had a basic idea of the character and I'd never even seen the Arnie movie, Conan The Barbarian (an admission I'm sure will be frowned on in some circles!). I was pretty certain that situation would always remain the same and I'd never give the character further investigation. Conan #0, published by Dark Horse in 2003, changed all that. I was impressed enough to return for the #1 issue, and have been hooked from thereon in. The title's consistently bowled me over with the quality of writing and art , and I'm not embarrassed to admit it: I'm a fan!! 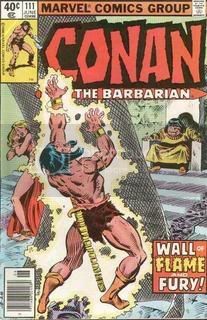 So what about all the Bronze Age Conan books from Marvel? Would I get the same thrill I do from the current stuff or would they all seem a bit dated by today’s standards? 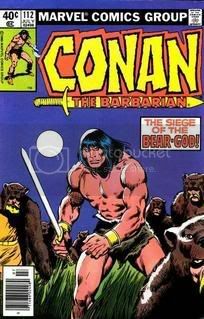 Only one way to find out: I took the plunge and picked up a pile of cheap back issues of Conan The Barbarian recently (all around #100 onwards - earlier issues are slightly more pricey!) to see how I'd get on. You know what? This stuff is frickin' great, by Crom! I should've known really: written by the vastly underrated Roy Thomas (underrated in the sense that, seeing how much amazing stuff he wrote he should be considered as one of the industry legends) with art by the late John Buscema (who's run on Avengers, inked by Tom Palmer, is pretty damn close to perfection), putting these two together meant you'd get a solid read at the very least. The issues I read exceeded expectations: action-packed, witty and highly addictive. 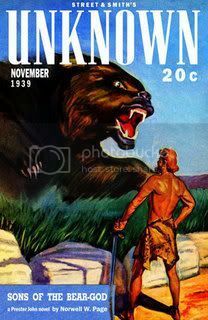 The main, complete arc in the bundle I picked up is an adaptation of the Sons Of The Bear God by Norvell W. Page which, from what I can gather through the magic of Google, is a pulp novel featuring Prester John and not the Barbarian himself. The arc runs from #109 to #112 of the comic and, whatever its origins, it's a damn fine adventure yarn. 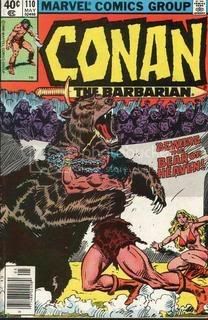 It starts off with Conan and his reluctant companion, Erfu - a wannabe sorcerer - being attacked by the Sons of Shem on the outskirts of the "haunted" Devil Grass. Outnumbered, they flee into the "emerald sea" and it doesn't take them long before another battle erupts between Conan and a bunch of dwarves who have mysteriously managed to enslave a band of brawny warriors from Aesgaard. The following chapters take us too the dwarf city where Conan hooks up with an enchanting young lady - the unfortunately named Tossa (!) - gets forced into a gladiatorial arena to fight a massive bear, decides to overthrow the dwarf-king, and typically acts like a law unto himself. Thomas brings the character to life with ease, no doubt after having spent so much time putting words in the Cimmerian's mouth writing him had become second nature - he nails the character's unsuppressed disdain at so-called "civilized" cultures. Buscema always excelled at portraying muscular men (or women) in the throes of battle, and while this may not be the best example of his work you could find it's still beautifully evocative and dynamic. So, count me down as full convert to Conan comics, be they old or new. I have no idea how this story stands up against other tales from the various books & magazines he appeared in during the 70s, but I'm guessing (and using the fact that I can't find any details of reprints as evidence and the original source material didn't even feature him) that this wouldn't rank as one of the most revered comic book adaptations of Howard's most famous creation. Which means there's a wealth of possibly even better material out there for me to get my hands on!! I'll be searching through back issue boxes and eBay for more (any recommendations would be appreciated!) and would advise anyone who loves the character but is only familiar with the Dark Horse series, to take the plunge too - I'd bet money that you won’t regret it! Blog looks like it's shaping up to being great. Well done guys! Since I'm Bournemouth's resident Robert E Howard expert, I couldn't resist commenting on this post. The Marvel output during the 1970s is well worth seeking out, particularly since most of it remains relatively cheap. There were a lot of Conan colour comics in the bargain bins at Bristol this year for 50p a throw, so your best bet to stock up will probably be Bristol 2008. By far and away the 'gold standard' is the Barry Smith period from issue 4 to issue 24 (Smith was also the artist in issues 1 to 3, but it's in issue 4 that he really gets a firm grasp on the Hyborian age). Issue 24 in particular – the Song of Red Sonja – showcases some of the best colour Marvel art of the seventies. Sadly it was to be his final issue, due to disputes relating to the return of the his pencil art. Perhaps equally essential are the B&W magazines Savage Tales (1 to 5, after which it became a Kazar title) and The Savage Sword of Conan (you can't go wrong with issues 1 to 30. And frankly, issues 16 to 18 are worth their weight in gold, featuring as they do not only a superb adaptation of People of the Black Circle by Thomas/Buscema/Alcala, but also the Barry Smith/Tim Conrad insanely detailed art in an adaptation of the Bran Mak Morn 'Worms of the Earth' tale – perhaps REH's best every fantasy story). The Buscema period began with issue 25 and, except for an occasional guest artist (usually of high calibre, such as Mike Ploog or Neal Adams) he drew everything until long after I stopped buying the title (my last issue was 151 – I have a complete run up until then). When Roy Thomas left the title (a few issues after the run you've written about) the comic began to lose steam. But basically you can't go wrong with any of the first 100 issues. Issues 57 to 100 in particular feature one immensely long story arc, centred around the REH story 'Queen of the Black Coast' which, although it's just a short story, takes up several years in Conan's life. Roy Thomas decided to cover the period in detail, and that story arc features Conan in a kind of Fantasy Africa version of Pirates of the Caribbean, when he sails the ocean plundering ships, alongside the love of his life, Belit. 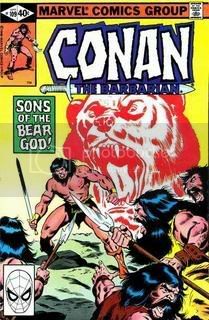 During '70s and '80s, Marvel managed to adapt every Conan story by REH and, pressed for additional source material, also adapted many non-Conan tales by REH and other writers, adding Conan as a main protagonist. The story arc you've written about is a prime example. A notable high point is a two issue run in the early teens of the comic, when number one Fantasy writer, Michael Moorcock, co-scripted a story with Roy Thomas that featured a pairing of Conan with Moorcock's brooding anti-hero, Elric of Melnibone. The first Conan film is also well worth checking out. It has a script b Oliver Stone and is directed by John Milius, who is also responsible for putting together the brilliant HBO/BBC Rome TV series. Milius has an obsessive love of history and REH's books, and despite the relatively low budget of the movie (don't expect Lord of the Rings style effects or a cast of thousands) approaches the film with historical accuracy (bearing in mind that REH borrows heavily from historical milieus) and a surprisingly serious tone that doesn't shy away from the non politically correct tone of the books. If you liked Rome, the director's take on Conan tried to achieve the same thing, within the constraints of a Hollywood industry that tried to rein in him, and wouldn't give him a very high budget to play with. James Earl Jones (the voice of Darth Vader) is magnificent as Thulsa Doom and even Arnie turns in a half way decent performance (even if he isn't how I imagined Conan to be). Also worthy of note is the soundtrack – several of the pieces are magnificently epic, especially during the opening sequences. Some great info there, Rob - I'll be keeping my eyes peeled for some of the comics you mentioned. King Kull: pre-Hyborian age period during the existence of Atlantis. Similar to Conan's period when he was King of Aquilonia. Solomon Kane: 16th century Puritan adventurer who explores lost barbaric cities in Africa, fights vampire races, and takes on various sorcerers and demons and Lovecraft inspired things. Bran Mak Morn: Pictish chief during the Roman occupation of Britain. Includes one of Howard's greatest stories (if not one of the greatest stories in Fantasy full stop): Worms of the Earth - imagine a Lovecraft version of the recent film Descent, set in Roman times, with a Conan clone as the main hero, and lots of dark eldritch Lovecraft magic. Almuric: Very similar to Edgar Rice Burroughs's John Carter of Mars series, with the main protagonist a human who is transported to an alien fantasy world. Red Sonja: originally a Russian mercenary character called Red Sonya who starred in one of REH's historical action stories (Shadow of the Vulture) set in the renaissance period. Roy Thomas reworked the character slightly and placed her in Marvel's take on the Hyborian age instead. El Borak: these stories are set during the 1920s/1930s and resemble the Indiana Jones films with the exception that the main character is a 20th century take on Conan rather than an archaeology professor. Cormac Mac Art: another Howard Conan clone of which I know very little as I've never read these stories. Dark Horse recently published a 4 issue mini-series featuring the character so if you read it, let me know what it's like! Cthulhu: Howard was one of the original writers of Cthulhu mythos stories (originated by H P Lovecraft) back in the days of Weird Tales magazine. Love this feature - great idea guys.